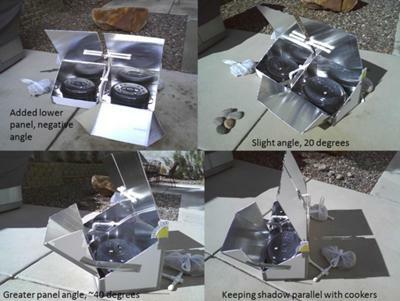 I mentioned, in a previous story, that my neighbor was looking for a science project idea and knew about my solar cooker hobby. After sitting down and discussing the rules of the project, I aided in the construction of two identical panel cookers. They were large enough to accommodate a roaster sized graniteware. With these two cooker setups side by side, we first tested that the temperatures matched, throughout a sunny/cloudy day. Thankfully the temperatures matched exactly, which established the control we were looking for. From there, we discussed variables that could be individually tested, as although the project simply called for one, maybe two...we changed many. It turned out to be a very enlightening project for my neighbors, and a lot of fun for me as well. In one test we had the two cookers with different panel angles on top. In another we added a bottom panel, and then changed the angle throughout the day to see the impact on the temperature. We placed an oven bag on one pot, and left the other uncovered. Very interesting project, especially on the first day when winds were howling through the backyard, which was very challenging. In one of the pictures, you can see where I put together PVC bracing (dryfit). Worked great, and it helped us in other stages of the testing, holding the single panel in place perfectly throughout the test period. Once the project was submitted, I finally had the chance to finish fitting out the cookers with all of the reflector panels. In my own experiment, I filled the pot with 13 lbs of water, covered the pot with an oven bag, and tested how fast the cooker could raise the water temperature. Very impressive. We'll be cooking a turkey in no time. As you can see from one of the pictures, despite a cloudy day on one test days, we cooked pork in my Global Sun Oven while data was gathered. 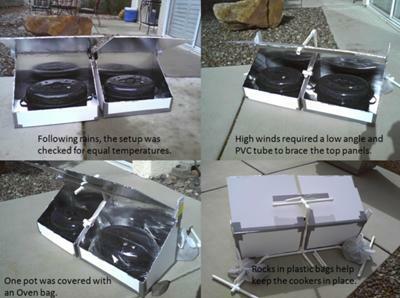 Being able to have you help them with such an all encompassing solar cooker science project was a boon for them. It really makes me glad that you share all of this with our site visitors as well, its a wealth of great information. I don't know if everyone knows that the Solar Chef has moved to a page on the Global Sun Ovens website, and she's posting some fantastic recipes. I have yet to cook pasta in my GSO, but she has me curious enough to try this sometime soon. Thanks to Nathan for providing this forum for thought, calculations, etc. I used to host a website, and I appreciate the effort it takes. My wish is for people to feel empowered by using the sun above, to provide them with power and life sustaining sustenance. 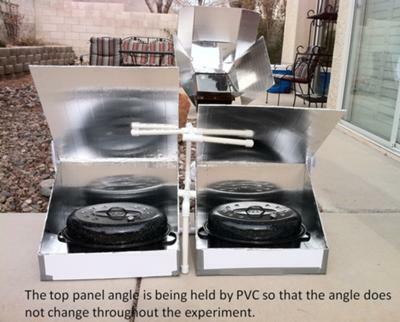 Simply mastering solar cooking will help you move towards a more balanced life, and the products offered on this website are a large part of that equation. When I cook with the sun, I realize that the Universe projects its own time-line, and that my own self-imposed expectations mean nothing...and I attempt to adjust. Now that I have two fairly identical panel cookers, with identical cooking pots, I'm hoping to test them as "controlled variables" once again. From there, I may do a little tweaking on the design to see which feature has the greatest impact. So far, the ability to focus the top panel on the pot, seems to be the most important factor. The insulation of the pot is another heavy factor. I'd like to compare the polycarbonate oven bag vs. a doubled oven bag setup vs. hot pot type arrangement (using glass bowl and glass plate),etc. 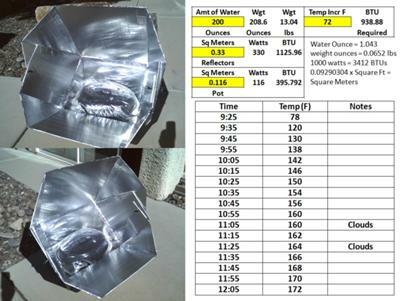 Hi, A nice,elegant design of Solar Cooker. I like the support for the back panel and ability to hold at an angle.This had been always a problem in my cookers with heavy winds.It is instructive that you could vary parameters and test the cooker for a school science project and sharing it with all of us.